Tag: FJS Consltating Pvt. Ltd. 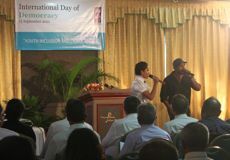 The UNDP International Day of Democracy was celebrated today under the theme “Youth Inclusion and Democracy” at the Nasandhura Palace Hotel. Representatives from the government, UNDP, and the Human Rights Commission spoke on democratic progress in the Maldives. Youth in civil society were widely recognised as a key factor for democratic growth in the Maldives. UN Advisor on Social Cohesion and Governance, Ferdinand von Habsburg-Lothringen, delivered the opening speech. “Civil society in the Maldives is impressive. It is an important avenue for young people to engage with their community and to hold leaders accountable,” he said. Habsburg-Lothringen noted that “democracy is still a new concept in the Maldives, and will take many years to mature,” and encouraged the Maldivian government to enact “crucial” laws, such as the penal code. Gender equality remains one of the biggest issues in the Maldives, said Habsburg-Lothringen. He noted that only 5 of the 77 MPs are female. The ceremony featured a presentation of the report, “Comprehensive Study on Maldivian Civil Society” by FJS Consulting. Managing Director Fareeha Shareef summarised the report’s findings on CSOs in the Maldives. Among the issues addressed was the disorganised categorisation of CSOs. “The government is trying to provide aid but the structure of how to do it is not specified,” said Shareef. “Some sports clubs and organisations didn’t even engage in sports activities,” she said. Shareef also commented on the CSO sector’s unique work force. According to the report, only 0.7 percent of employees are paid, and the average employee is age 25 with an education ranging between grades 6 and 10. There are 1100 CSOs registered in the Maldives. Funding is also a struggle. The report found that donors were the least common source of funding, and many CSOs organise events to generate income. One example was a CSO that went fishing to generate program funding. The report notes that these events only cover about 30 percent of the total program cost. The report recognises that the Maldives has the resources to support a strong civil society, but recommends bringing in older employees to provide guidance. “Imagine the potential of the sector if the resources were channeled in an effective manner,” said Shareef. Chief Guest speaker Mariyam Azra Ahmed, Chair of the Human Rights Commission, said “a vibrant civil sector and independent media, among others” were essential for growth. She also advised a stronger dialogue between citizens and the government. “Lifestyles incorporating compromise, cooperation, and consensus building should be a consistent, recurring feature in a democratic society,” she said. The event included a performance by musician Yes-e and singer Grey, for whom the performance was her debut. “I was a bit nervous, and the audience wasn’t very lively, but it was a good event,” she said. Following a tea break, a vigorous student debate was widely attended by members of civil society, UNDP, and the government. Gesticulating throughout the debate, the students of Aminiya and Dharumavatha schools demonstrated passion and ambition for democracy in the Maldives.